Have you seen the new Star Wars movie? The Force Awakens? I have – two weeks ago actually. It is AWESOME!! I love it so much I made a shape poem all about BB8. He’s the new droid in the movie. My favorite person in the movie is Rey. She’s a scavenger from Jakku who realizes she has the force. She’s kind of the main character. The movie is PG-13, and I can’t watch those movies until I’m older, so my parents rented it on VidAngel which edits the movie and takes out all the bad words and violet parts, so your kids can watch it. I also read the book of the movie so I knew when they took out a violent part. 😉 I think you’ll love it! 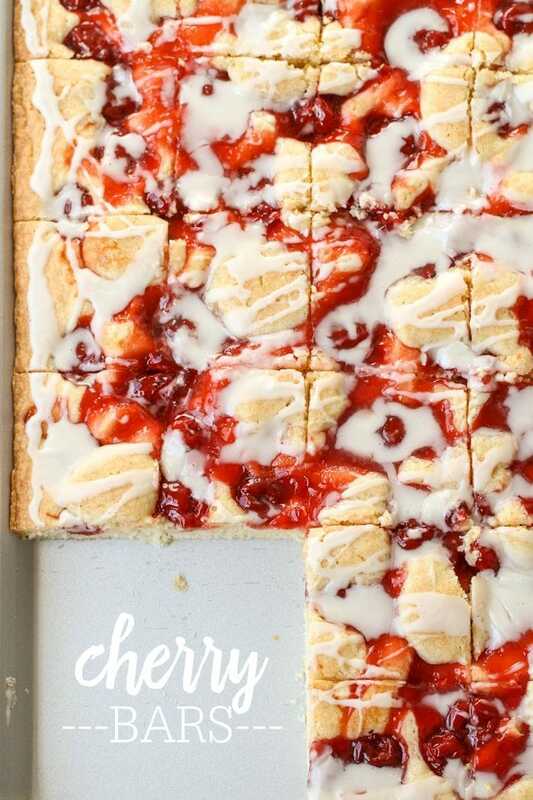 Speaking of things you’ll love, I think you’ll REALLY like this Cherry Sheet Cake. My favorite part is all of it because I love cherries. I really like the frosting because my mom put in her favorite ingredient: almond extract!! We also put in love which makes it really good. 😀 We have tried a lot of fruity cakes recently, but this one has to be my favorite. My second favorite is Fruit Pizza – it’s so good!! 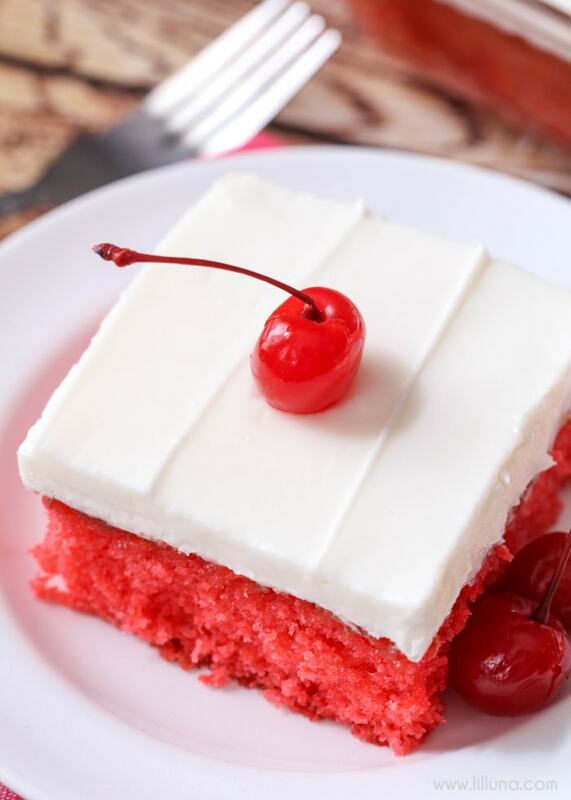 If you love cherries, then you gotta try this dessert. It’s AMAZING! 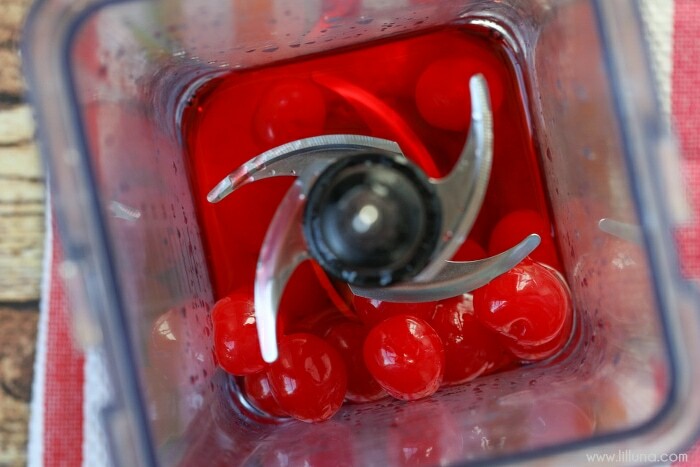 Begin by adding your cherries to a blender or food processor and blending. Mix cake mix, eggs, oil and water in a large bowl until well blended. Add JELL-O mix and pureed cherries. Mix well. While cake is cooling make frosting by creaming together the butter and cream cheese. Add powdered sugar, almond extract, and milk - blend well. Frost cake. ENJOY! Hope you have a great time making this. I hope your kids love it just as much as we do!! It is definitely delish! Did you try it? If so, how’d you like it? Do you add the juice from the cherries too or drain off? I was wondering the same thing and then I saw the picture above and it looks like she adds in the juice with the cherries. Thanks Tammy, I see it in the blender now. Thanks for pointing that out! Yes, they are drained:) Enjoy!!! 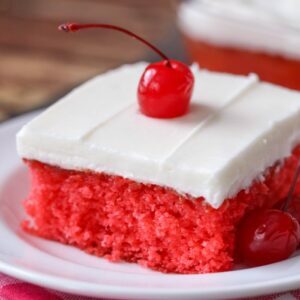 Can I use a homemade cake recipe instead of a box mix? Would I have to adjust the quantities of the cherries etc? This looks so yummy! 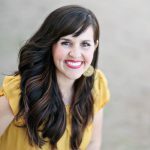 Thanks for sharing at I’m Lovin’ It Link Party. It is delicious!! Hope you give it a try:) And, thanks for linking up!! Thanks for linking up!! It is so good:) I hope you give it a try! Let me know what you think. Made the Glazed Cherry Bars for my family for Sunday Morning breakfast before church. Wow! We all loved them. Can I use other fruit fillings with this recipe? Enjoy your recipes and craft ideas so much. It goes in with the cake mix:) You’re welcome!! Enjoy! SO glad everyone love it!! We haven’t tried it with other fruit, but I don’t see why they wouldn’t? Maybe find a jello flavor that would match your fruit. Let me know if you try it another way! Should some of the juice be drained from the cherries before processing, or should the whole amount be used? The directions don’t specify. 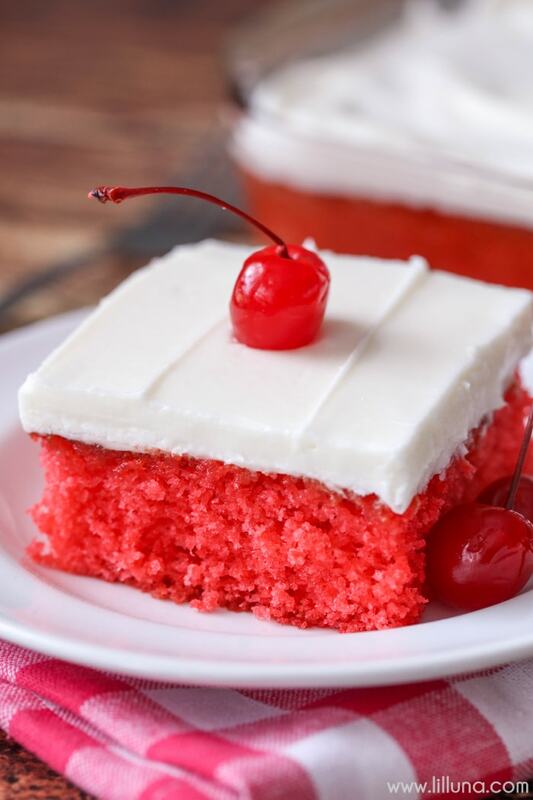 I have a granddaughter who is a big fan of maraschino cherries so this will be the perfect birthday cake for her. Thank you for a great website. I drained the cherries. I should have added that!! Thanks for asking..I’ll have to add it in. 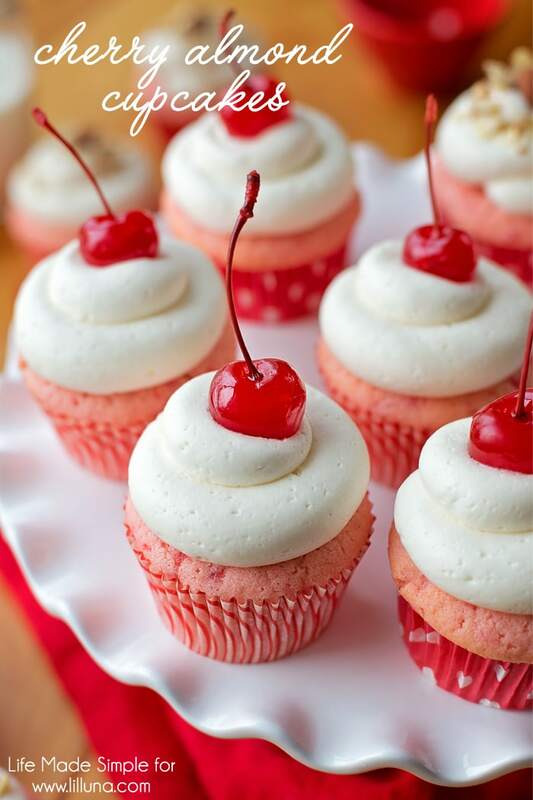 We love cherries, too! Hope she likes it! I wanna make this for my daughter’s bday but I’m confused. The recipe calls for water but doesn’t say were to add it. Also the frosting calls for milk but doesn’t say were to add it either. The water goes in at the beginning. It’s added to the cake mix, eggs, and oil, step 3. The milk is added in step 7, with the other frosting ingredients. Sorry to respond late…hope it’s not past your daughters bday! For the glazed cherry bars, how big is a “large sheet cake” pan? Thanks for your help. I used a 9×13, but you could use a 11×13, too. Hope that helps!! I only had about half a jar of cherries at home, so I added an extra packet of Jello (0.5oz)… which made the taste a little too strong. Still SO good, though! So glad you tried it!! Thanks so much for letting me know! 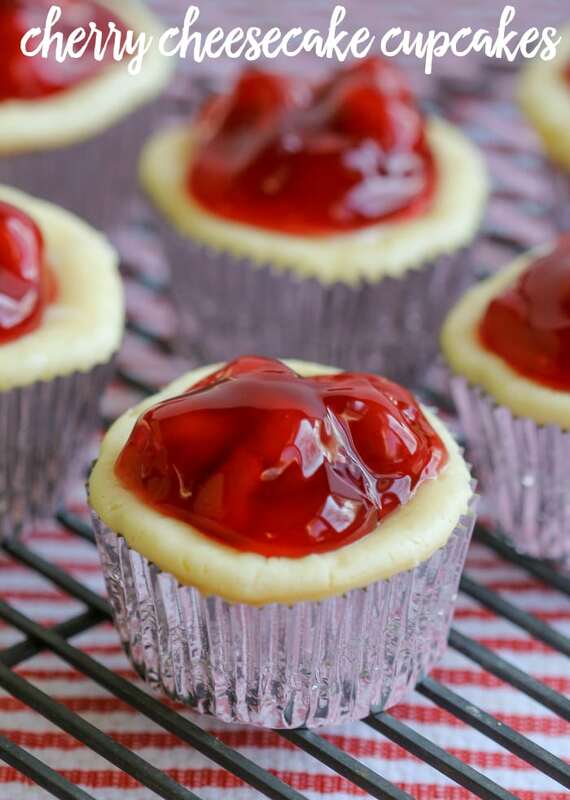 Have you tried using this recipe for cupcakes? I’m going to attempt it now and was wondering if any adjustments need to be made to the recipe. Not yet, but they’d by great as cupcakes! I’d keep the same temperature, but follow what the cake mix box says for cooking time on cupcakes. Let me know how they turn out! Thanks for stopping by! 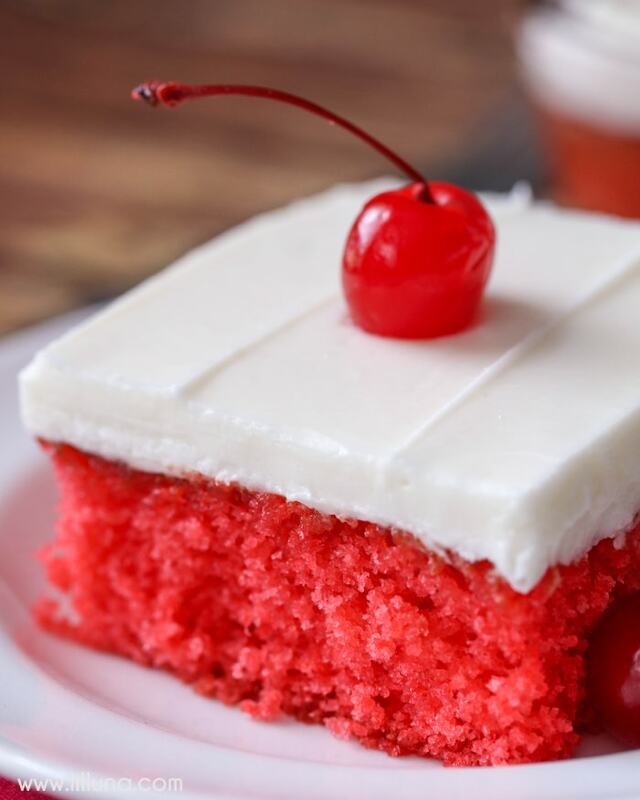 Is there a substitute for the maraschino cherries? I’m not a fan of them although the cake sounds really good! I have a recipe for lime sheet cake…https://lilluna.com/lime-sheet-cake/ or you could do this lemon sheet cake…https://lilluna.com/lemon-sheet-cake/. Do you like lemon or lime? I don’t have instant jello is that gonna work???? I haven’t made this without the jello before, so I can’t honestly say how it’d turn out. The jello gives the color and added flavor. I wish I could tell you. If you try, I’d love to know how it comes out. Thanks! Hi! My daughter loves cherries. 2 questions. would this work as a 2 layered round cake? and second, how about chocolate frosting? Thanks! I haven’t tried either those, but I bet they’d both work. Chocolate & cherry would taste great together! Let me know how it turns out! Thank you! 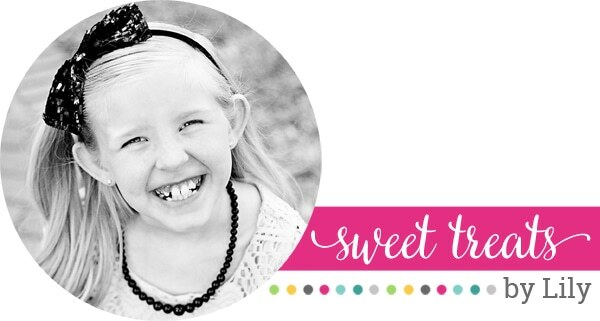 I’m going to try it for her 4th birthday in a couple of weeks…I’ll let you know! Haha..thanks!! We love this cake!!! I’m glad you liked it and thanks for letting me know!! I love cherries! This is so delicious, I use an 11″x15″ jelly roll pan and cut into bars. We do too!! Thanks for stopping by and sharing that!! Hi! I am wondering if this cake needs to be refrigerated since it has the milk and cream cheese frosting?! I just made it for a camping outing and didn’t even think about it till now. I would suggest keeping it in the fridge. Could you keep it on ice in a cooler? I really like your foods, this looking so pretty and testy, i think it will be best for good fitness. We love this cake!! Hope you give it a try and like it 🙂 Thanks for stopping by! 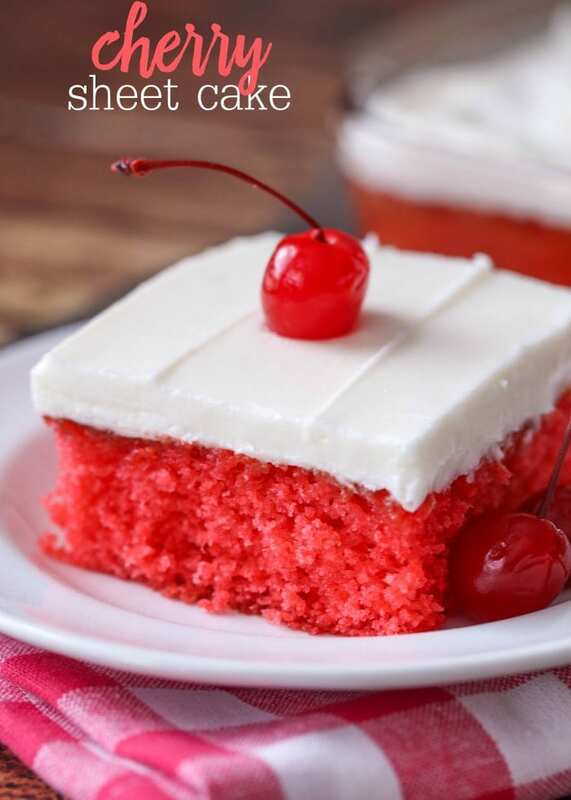 I’m about to make the cherry cake but I could not find cherry INSTANT jello – just regular jello. Will that work?? Honestly, I haven’t tried. It will just take longer, but it should be ok. I’d love to know!! 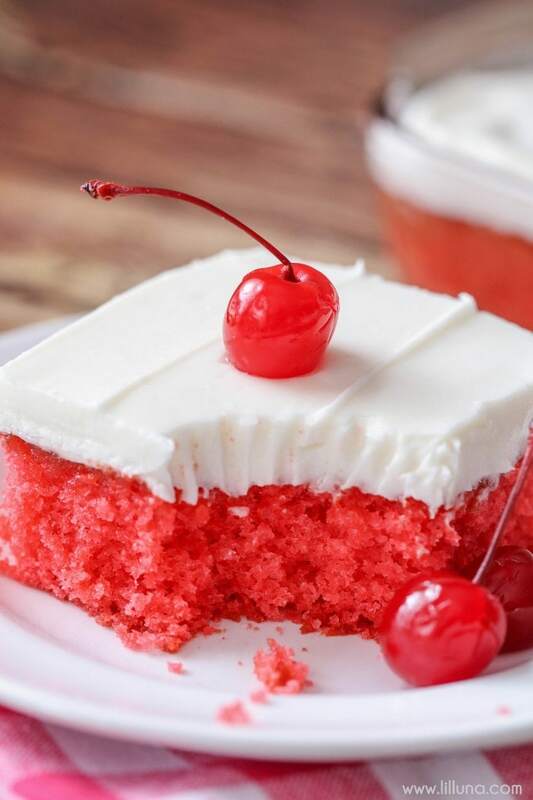 This cherry cake was a big hit with my boys and hubby! Thank you! That makes me so happy to hear!! Thank you for letting me know & thank you for giving it a try! Is this the instant gelatin cherry jello? Yes 🙂 Hope you like it!! Thanks! So yummy! One of the best cakes I’ve ever made. I made them into cupcakes for a church event and everyone loved them! Oh, thank you!! We love this recipe, too!! That’s a great option, to make them into cupcakes! I’m honestly not sure what happened with the cherry bars. I haven’t had that happen before. I’m sorry! I also made the sheet cake with a chocolate cake mix and it was very good as well. I used extra cherries and it was very tasty. I made the cherry bars also and the bottom came out very soggy..what do u think went wrong? Thank you for sharing that!! I am so glad it worked and that you liked it! If I use a round cake pan. Will this be the same recipe or will I have to alter it? I haven’t made it in a round pan, but I’m guessing you would divide the batter into two, since those are a lot smaller. Usually the cooking time is a little longer, since it is smaller, but I wouldn’t know how long. It’s one of those, where you’d need to just keep an eye on it. My frosting came out nothing like the picture. Your recipe is 2-3 tablespoons of milk? Frosting was runny. What’s the secret!? Thanks in advance! Add more powdered sugar, if it’s too runny. If it’s too thick, then you would add more milk. Enjoy! Thank you!! Hope you find some to try! It is jello & you should be able to find it in the baking aisle 🙂 Hope you try it! Awe, thank you so much! I hope you so try this!! Looks good.Making it this weekend.My grandkids will love this recipe.we are sure going to Enjoy it.